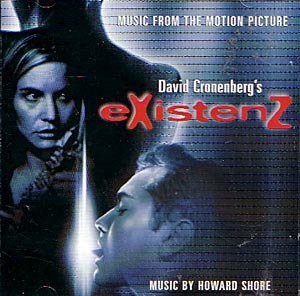 Howard Shore’s score to David Cronenberg’s movie eXistenZ is one of my favourite. RCA Victor’s release of the score in 1999 is typical for a non-speciality label’s release of a soundtrack. Unlike speciality labels such as Film Score Monthly and Intrada whose releases usually features an in-depth run-down of each track (including a summary of action in the film covered by the specific music of the track), there was no in-depth information on how the music fitted with the film. All the information contained in the 4-page CD booklet amounted to some music credits, thanks to various people, a tracklisting and some black-and-white film publicity shots.